During his five full seasons with the Boston Red Sox, Babe Ruth established himself as one of the premier left-handed pitchers in the game, began his historic transformation from moundsman to slugging outfielder, and was part of three World Series championship teams. After he was sold to the New York Yankees in December 1919, his eye-popping batting performances over the next few seasons helped usher in a new era of long-distance hitting and high scoring, effectively bringing down the curtain on the Deadball Era. George Herman Ruth was born to George Ruth and Catherine Schamberger on February 6, 1895, in his mother’s parents’ house at 216 Emory Street, in Baltimore, Maryland. 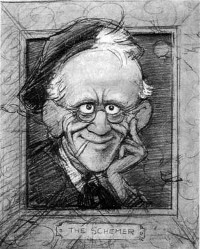 With his father working long hours in his saloon and his mother often in poor health, Little George (as he was known) spent his days unsupervised on the waterfront streets and docks, committing petty theft and vandalism. Hanging out in his father’s bar, he stole money from the till, drained the last drops from old beer glasses, and developed a taste for chewing tobacco. He was only six years old. Shortly after his seventh birthday, the Ruths petitioned the Baltimore courts to declare Little George “incorrigible” and sent him to live at St. Mary’s Industrial School, on the outskirts of the city. The boy’s initial stay at St. Mary’s lasted only four weeks before his parents brought him home for the first of several attempted reconciliations; his long-term residence at St. Mary’s actually began in 1904. But it was during that first stay that George met Brother Matthias. http://www.viximus.com/_Viximus/Photos/Raw/5D19583E-85E4-4EC9-BDF2-8516D17F5D1E.jpg http://www.viximus.com/_Viximus/Photos/Raw/AD228DC6-EAFB-4BCC-AF20-55C6EEBAF3D7.jpg http://www.viximus.com/_Viximus/Photos/Raw/4591472C-4493-4232-8915-FD9B0D06D41E.jpg http://www.viximus.com/_Viximus/Photos/Raw/9A41D42F-4A61-474B-8665-F20B43BA6E63.jpg Ruth is credited with changing baseball itself. The popularity of the game exploded in the 1920s, largely due to his influence. Ruth ushered in the "live-ball era", as his big swing led to escalating home run totals that not only excited fans, but helped baseball evolve from a low-scoring, speed-dominated game to a high-scoring power game. He has since become regarded as one of the greatest sports heroes in American culture. 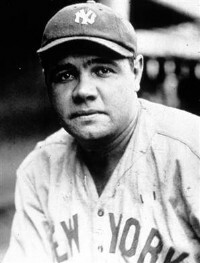 Ruth was the first player to hit 60 home runs in one season (1927), a mark not surpassed until Roger Maris hit 61 in 1961. Ruth's lifetime record of 714 home runs stood until 1974 when it was surpassed by Hank Aaron. Unlike many power hitters, Ruth also hit for a high batting average: his .342 lifetime average is the tenth highest in baseball history, and in one season (1923) he batted .393, a Yankee record. 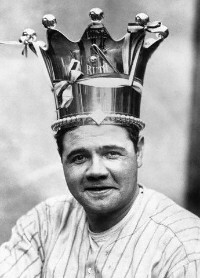 George Herman "Babe" Ruth, Jr., nicknamed "the Bambino" and "the Sultan of Swat", was an American baseball player who spent 22 seasons in Major League Baseball playing for three teams. The sale of Ruth to the Yankees was announced after New Years 1920 and although it was big news, public opinion in Boston was divided. Many fans were aghast that such a talent would be cast off, while others, including many former players, insisted that a cohesive team (as opposed to one egomaniac plus everyone else) was the key to success.